Premier League spending in the January transfer window fell for the first time since 2012. Alvaro Morata has played under two Chelsea head coaches and neither fancied him. Despite his credentials as a Champions League winner, the Spaniard never looked at home in Chelsea blue. The club were trying to replace him as early as last January when Olivier Giroud was brought in from Arsenal. There has been a similar striker-go-round this winter due to Maurizio Sarri’s dissatisfaction with the former Juventus man. He has got his preferred centre forward in Gonzalo Higuain with Michy Batshuayi also making way. AC Milan have replaced the Argentina international with Krzysztof Piątek and Morata has landed a dream move to his boyhood club Atletico Madrid where he can attempt to resurrect his career. And he can do it away from what is shaping up to be an impending disaster at the Bridge. The transfer window started dismally for Arsenal with Unai Emery admitting that the club would be unable to land any permanent deals this January as there simply were not the funds available. That came as shock to many Arsenal fans who were perhaps hoping for upgrades in the defensive and midfield areas, which required bolstering. Then came the news that Aaron Ramsey, who Arsenal decided against renewing, would be signing for perennial Italian champions Juventus. To top it all off head of recruitment Sven Mislintat departed the club barely a year after taking up the job. At the death, they missed out on Ivan Perisic and the signing on loan of Barcelona reserve Denis Suarez reeks of desperation. Barcelona’s desperate search for a backup striker took them down some pretty unlikely paths this January with former Middlesbrough forward Cristhian Stuani in the running at one stage to play understudy to Lionel Messi and Luis Suarez. That role in the end went to 31-year-old journeyman Kevin-Prince Boateng, familiar to Premier League fans as a one-time Tottenham and Portsmouth midfielder. He plays as a centre forward these days and was in decent nick for Sassuolo in Serie A before the winter break and a pelvic injury put him out of action. He has some La Liga pedigree having played a season there for Las Palmas but can probably scarcely believe his luck now that he gets to train alongside the best player in the world every day. 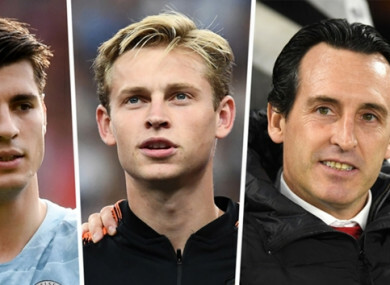 Frenkie De Jong ultimately opted for Barcelona after becoming the most-sought after asset in the market. Ajax will profit to the tune of €75m for the sale of their midfielder, but will hold onto him until the summer. PSG were with Barca every step of the way but could not attract the young Dutch standout. Instead they went for Zenit’s Leandro Parades at a vastly inflated €42m, who has pulled up no trees in Russia. Other targets they failed on were Everton’s Idrissa Gueye and Julian Weigl. Worse still has been the news that Neymar is confirmed absent for at least 10 weeks with a metatarsal injury. He will miss their Champions League double-header against Manchester United. They also face the prospect of losing wantaway midfielder Adrien Rabiot on a free in summer, with Thomas Tuchel having been forced to reintegrate the exiled midfielder into his plans late in the window. It’s not every team that can command around €60m for one of their fringe players but Borussia Dortmund managed exactly that in selling Christian Pulisic to Chelsea. The American is destined to be one of his country’s finest ever players but if he cannot get into the Dortmund team right now what chance has he got of making the Chelsea team? He has suffered this season due to the presence of two new players in Jadon Sancho and Paco Alcacer. Those two — along with Marco Reus — have been too hot for the Bundesliga with Dortmund sitting top. Pulisic has been watching from the bench and with good reason too. He is not on their level. Speaking of Jadon Sancho, Manchester City lost two of their shining prospects this January in Brahim Diaz to Real Madrid and Rabbi Matondo to Schalke. Those two transfers — like Sancho — confirmed that the very best youngsters will seek a path away from City unless they can get some minutes under Pep Guardiola. He has been fruitlessly chasing another midfielder — with Frenkie De Jong not being convinced about the project on offer in Manchester. Guardiola has been at pains to explain that City won’t be held to ransom over wages and fees — despite their Abu Dhabi-derived wealth — but the list of targets they are failing to land is becoming longer by the window. Major League Soccer is coming to be known as one of the best developmental leagues for young talent anywhere in the world. That is proven by the calibre of club which is looking Stateside to recruit talents this January. Newcastle shattered their club transfer record and MLS’ historic mark to attract playmaker Miguel Almiron from champions Atlanta United. This winter, Canada forward Alphonso Davies joined Bayern Munich from the Vancouver Whitecaps and defender Chris Richards from FC Dallas was also signed by the German giants after a spell on loan. RB Leipzig acquired Tyler Adams from sister club the New York Red Bulls while Zack Steffen is due to join Manchester City from Columbus Crew in the summer. MLS has a burgeoning reputation of being the ideal middle ground between the rough and tumble South American league and the rigours of the top level in Europe. And as more young players see the likes of Almiron and Acosta ahead of them earning big moves, the more they might be inclined to follow. Atlanta have already paid a record fee to sign Gonzalo ‘Pity’ Martinez from River Plate as Almiron’s replacement while Lucas Rodriguez has moved to DC on an initial loan deal. Email “The winners and losers of the January transfer window”. Feedback on “The winners and losers of the January transfer window”.